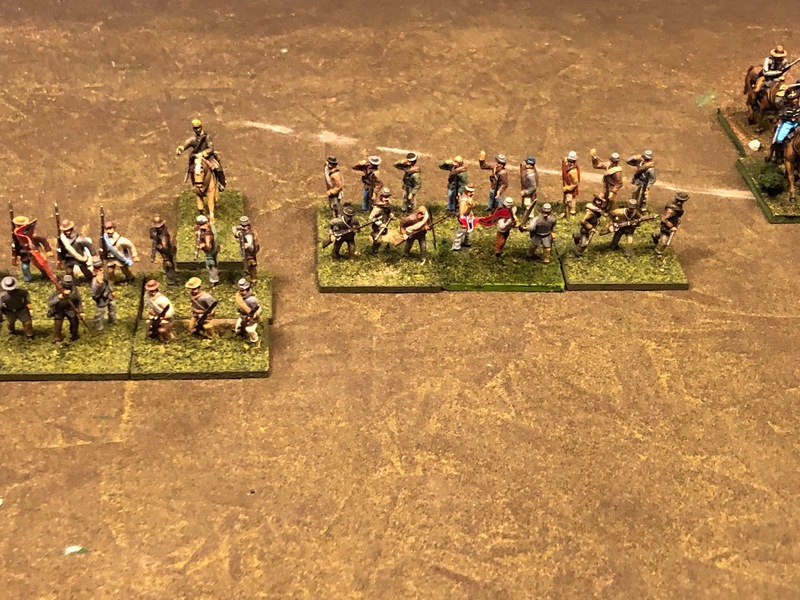 Readers of this blog may know that I returned to wargaming and painting figures after about 25 years. 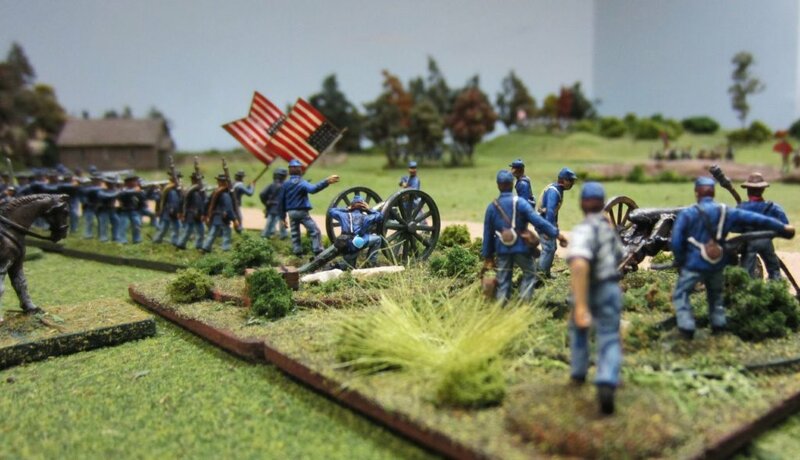 One of my favorite periods back in my original wargaming days was the ACW. Back in those days (70's and 80's) the rules of choice for the period was a set called Rally Round the Flag. Rally Round the Flag (RRTF) was a set of rules scaled where one fig represented 20 actual men and one gun represented an artillery section of two guns from a battery. 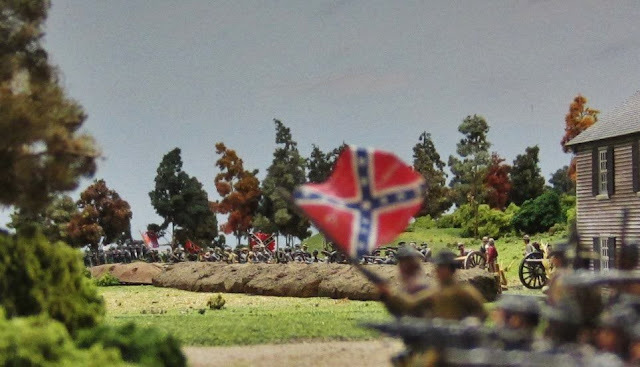 The figures were 25mm Confederals but also 22mm Musket Miniatures and quite a few Airfix from the time when that's all there was. 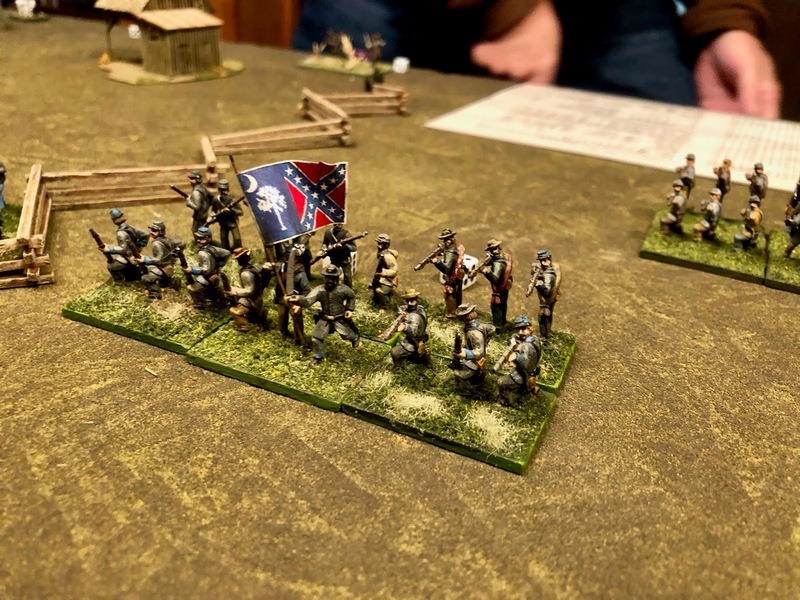 The rules were modified to fit our tastes but the game remained a regiment\brigade\division type game even though Johnny Reb I and other sets had appeared that may have been better. Our little group was satisfied with what we had and that was that. 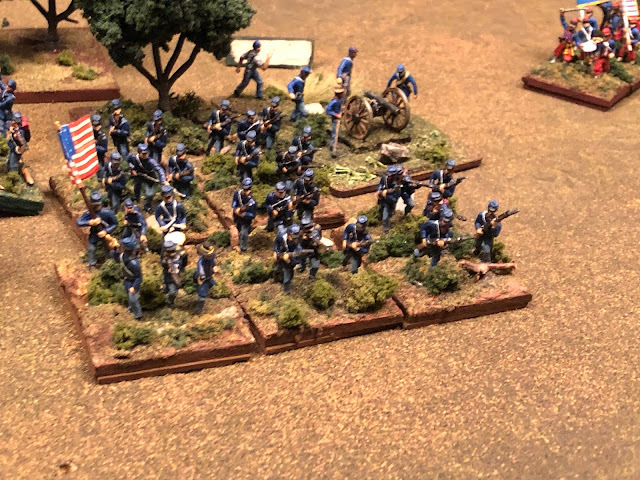 When I reconnected with my old friends I wanted to do ACW again. One friend still had two brigades of my old figures and I had a kept some as well. It didn't take me long to paint up some more using some of the excellent plastic figures that had come out in the last 25 years but also some more metal figures in 20mm from different manufacturers. 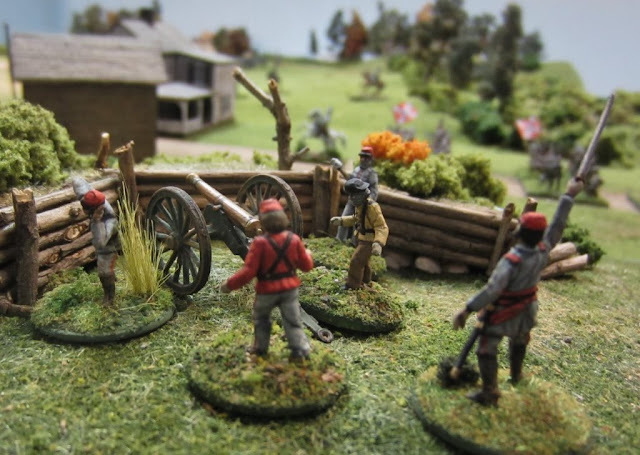 To get a fresh start I selected Black Powder rules for the period. I hold that it is an excellent set of rules once you learn the mechanisms and memorize them. But that was our problem. We didn't play enough ACW to memorize them and remembering agreed upon conventions became a problem. I longed for a simpler time when I and my friends could use a few charts and play a fun game in a few hours. I commented to my friend that I wish I had kept my old copy of RRTF. It would be fun to dust it off and try again even if it was just for nostalgic purposes. Well, he kept his and gave it to me. I then planned two games that brought the old rules back to life. The first game was a non-historical test game and it was a little bumpy as we tried to remember the conventions we had used way back in the 70s and 80s. It wasn't bad however so I took a lot of notes and made some new charts and decided to try it again. This time we did a scenario from one of the book that the Potomac War-game Group put out. They are available on Wargame Vault in PDF form. I'm not certain what rules they are for but the scenarios adapt well or our purposes. 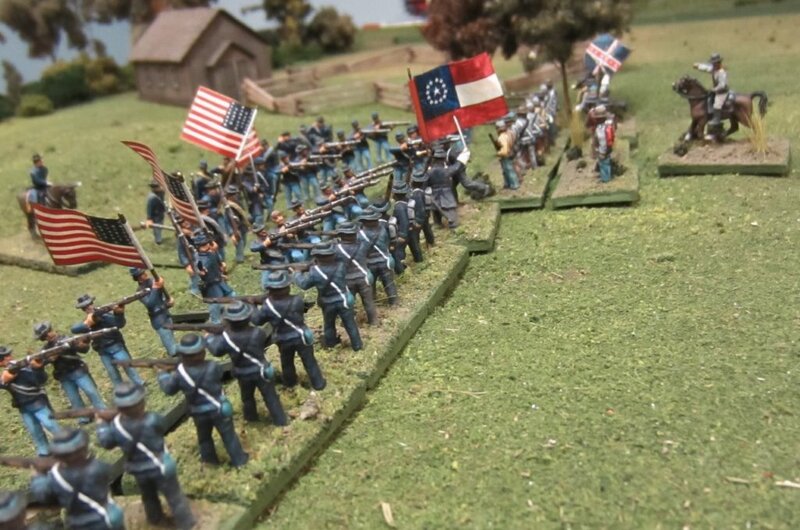 We did the Battle of Greenbrier in late 1861 in what became W. Virginia in 1863. Despite me, the game master, making a few key errors it went well. Everyone thinks a few more games and we should have the rules down. 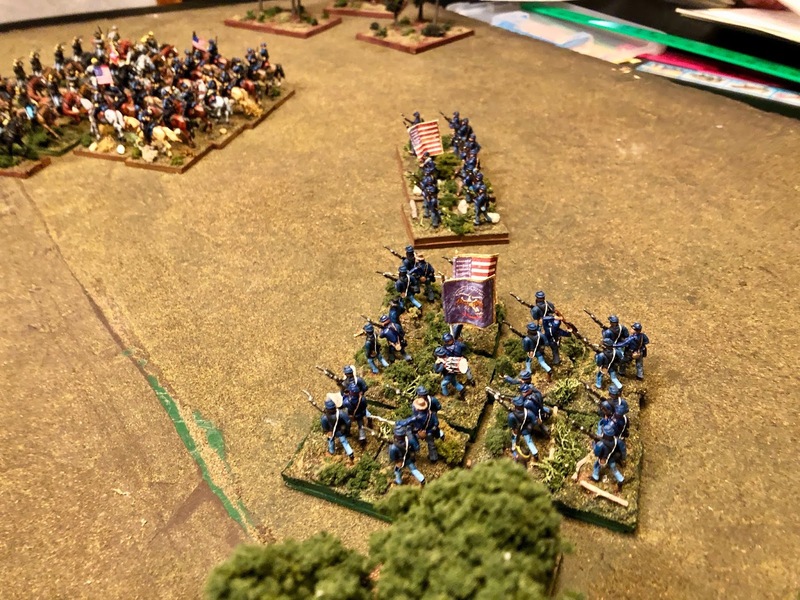 We took pictures of both games but detailed battle reports are not really available since I was concentrating more on rules and less the flow of action. Nevertheless, I'll make a few comments and if nothing else the games showed off some nice figures. 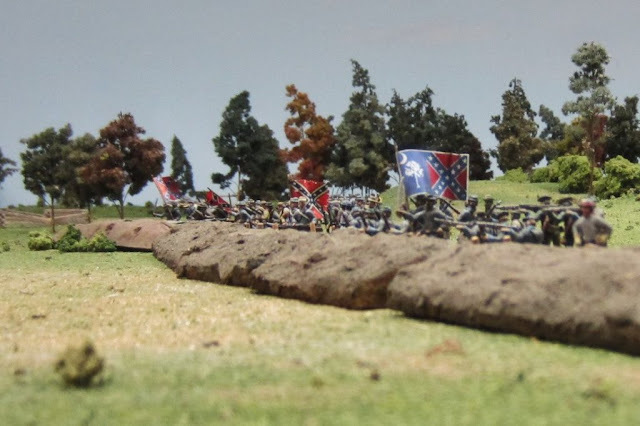 In the first game the Rebs held an extensive fence line. The miniatures here are all Musket Miniatures. These are Newline 20mm Union Cavalry-excellent figures and among my favorites. 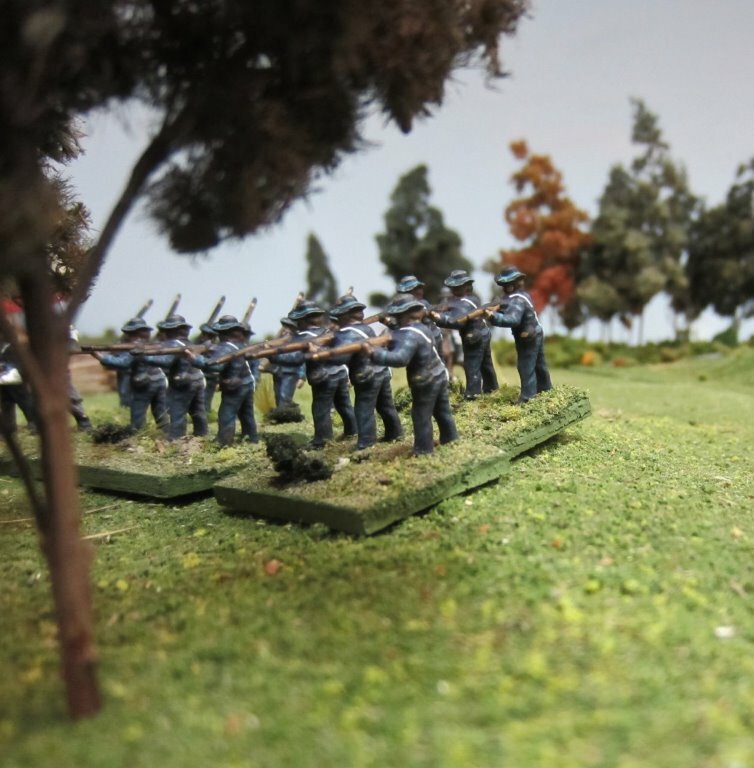 More Union Musket Miniatures but also a few plastics that fit in well. Musket Miniatures again. 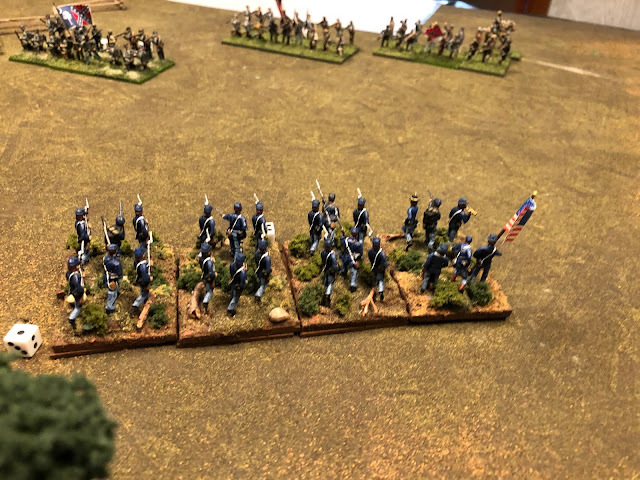 The Union Regiment has suffered casualties and is marked for a morale check. This Union flank was turned in our first game. South Carolina Rebs. These figures and the flag were painted in the late 1970's or early 80's. Cavalry mash up in the first game. The Rebs are Italeri. Italeri make some of the finest plastic figures around. The Reb cavalry would win this battle. They are painted up to represent Hampton's Legion. 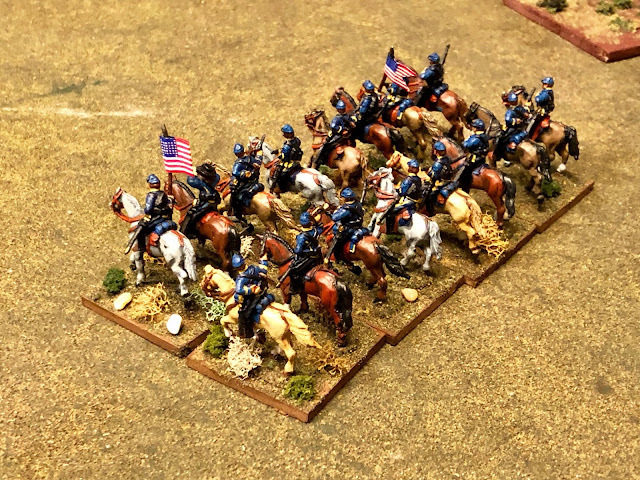 Just before the Union Cavalry routs. The pictures below are from the Greenbrier game. 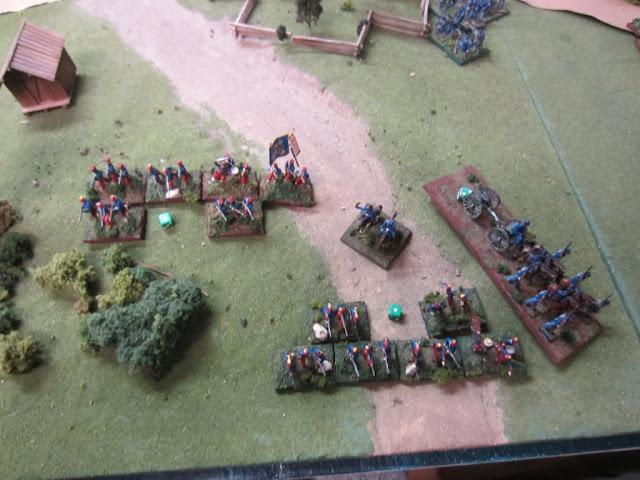 The Union was supposed to outflank the Rebel position by taking the battery. They never got close. 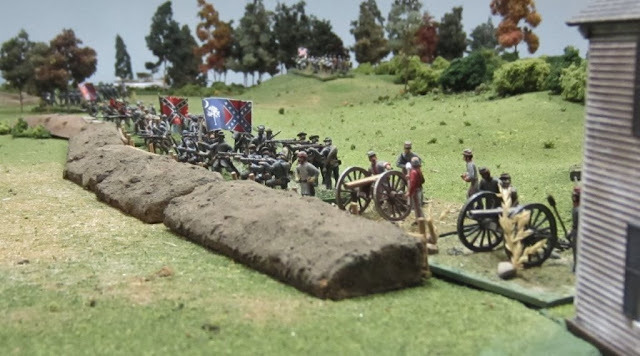 The Confederates had quite a few units with smoothbore muskets and all their artillery were obsolete 6lbs. They did just fine. 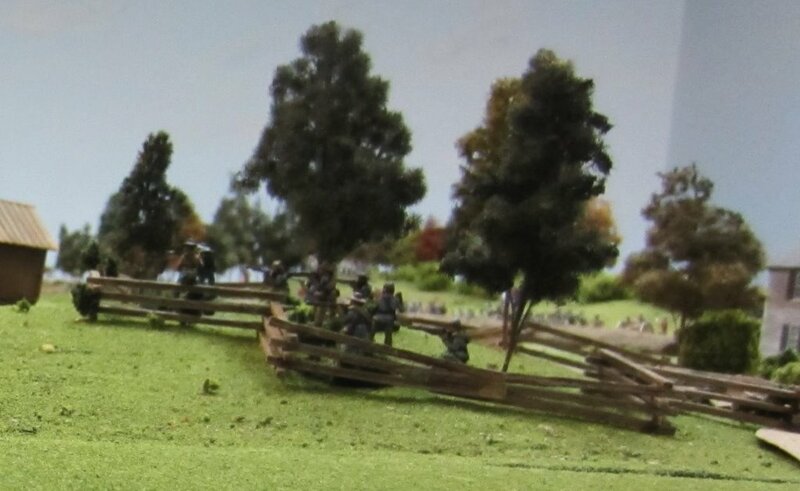 Nice close up of the 6lb battery and Confederate line behind light works. This section was on a small hill that overlooked the bridge crossing. The figures are old Airfix classics and some IMEX. 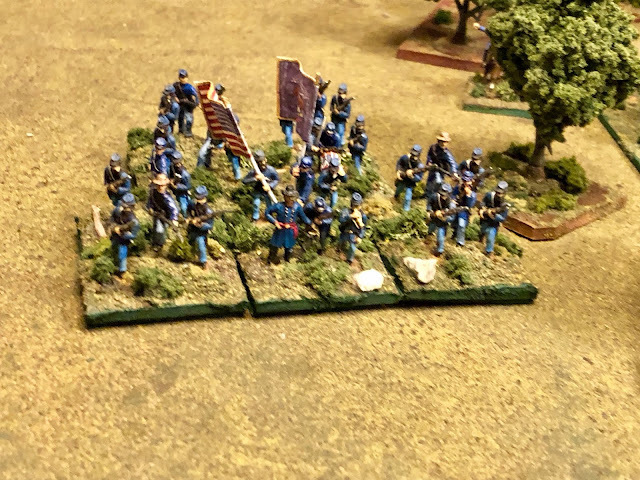 They are hard to see but there are 10 Reb sharpshooters in the fenced orchard playing the devil with the advancing Yankess. An Ohio battery playing the devil with the Rebs across the deadly field! Classic Arifix Rebs in an early war uniform. Careful, could be blue-bellies! A brigade of Ohio boys. They did their best to turn the Confederate right but did not have any support from the Indiana brigade on the Union right. The CSA sharpshooters in the corner of the fenced orchard. They did their job in delaying the Indiana brigade. 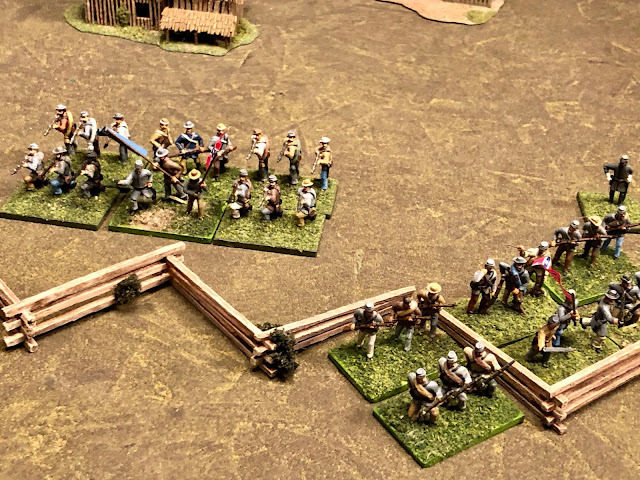 Safe and secure which is a good thing because most of the units are small and are equipped with smooth board muskets. Historically, the CSA forces in the battle were small because many were in camp with sickness. Sickness probably killed more Civil War soldiers than musket balls. 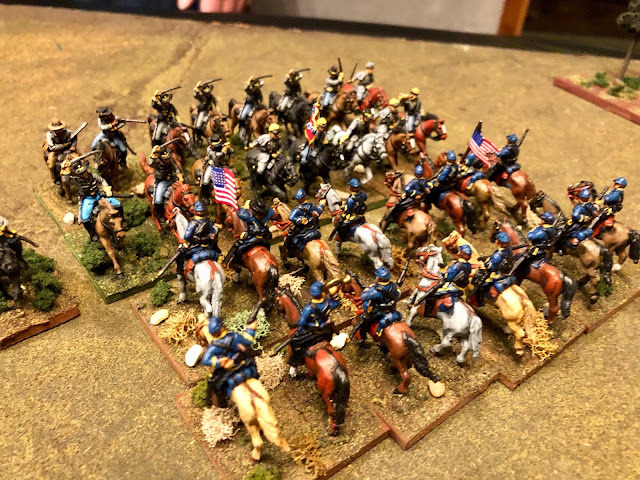 My Zouaves representing part of an Indiana Brigade. They both routed due to sharp shooter fire. They rallied but really didn't get it together until it was too late. 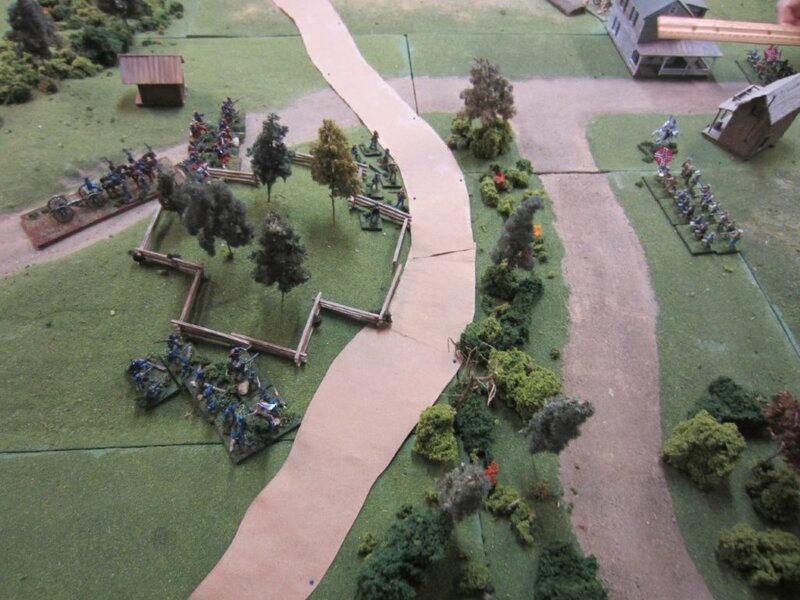 The artillery battery routed as well as the CSA 6lbs hit it while limbered with devastating results. Union high tide. 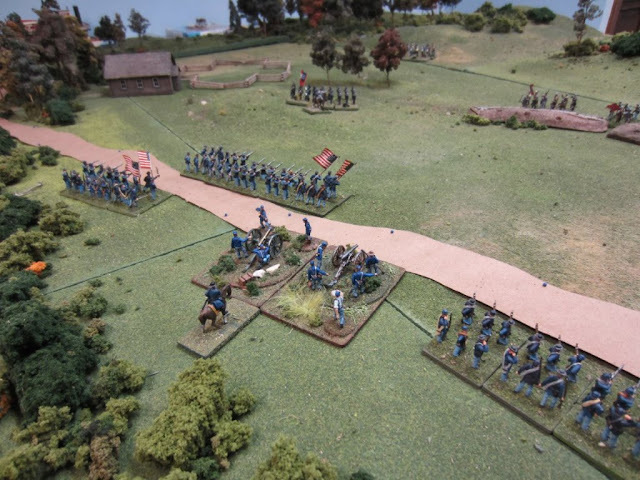 The Confederates lost heavily but held and two of three Ohio regiments routed. Same melee from the CSA post of view. CSA figures are all Airfix.